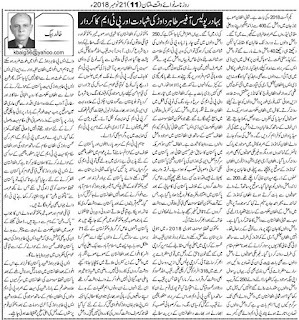 Truth by Kbaig: Martyrdom of Brave Police Officer SP Tahir Dawar and the Role of PTM! Martyrdom of Brave Police Officer SP Tahir Dawar and the Role of PTM! This is the 1st August 2018, more than 400 ISIS terrorists along with 2 high command local leaders are entrapped by Taliban. ISIS terrorists faced Taliban for 2 days, but in no time more than 40 ISIS terrorists were killed. ISIS leader Mufti Naimat contacted NDS Chief in Kabul for help. obviously, he would have contacted CIA in the Kabul otherwise NDS or Afghan National Army alone was not in the position to provide support to the ISIS terrorists. Kabul govt. and US army in the Kabul wanted to hide this information from media having concerns that Taliban may provide the report to the media about the American support to ISIS terrorists. along with the Afghan commandoes representatives of New York Times and two other foreign journalists were also sent to help ISIS terrorists. before commandoes reached the spot, Afghan Army Aviation and Air Force had made the Taliban flee from the area. More than 200 ISIS terrorists were rescued. Afghan Commandoes representative Major Ahmed Javed Saleem told the journalists that as ISIS terrorists have laid down their arms in the current operation thus ISIS has been eliminated from Northern Afghanistan. The ISIS terrorists were happy that they have been saved from Taliban; afterward, they were sent to unknown destination into the vehicles of Afghan National Army. Foreign journalists also talked to the ISIS terrorists and made their pictures recording the whole story. Here this question is of grave importance that what was done to the 250 ISIS terrorists rescued from Taliban? Were any cases registered against them? To which prison were they sent? Why ISIS is still active in Northern Afghanistan? 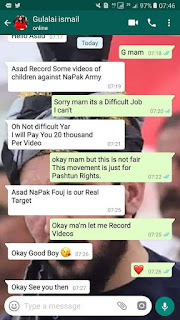 The most important thing is that while taking pictures of the ISIS terrorists few members of PTM (Pashtun Tahafuz Movement) were also captured by the cameras. One may ask that out of 250 ISIS terrorists how PTM members can be identified? They were identified by the specific caps worn by the PTM that were worn only by 3-4 people in the crowd of more than 250 ISIS terrorists. Other ISIS terrorists were wearing turbans. Moreover, the PTM's specific cap that is only manufactured in Afghanistan, similarly shaped tents were erected by the ISIS in the areas controlled by them in the Nangarhar province of Afghanistan. These tents show the links between PTM, Afghan govt., NDS, Hussein Haqqani, MQM's Altaf Hussein and ISIS of Afghanistan. Whether this is the Altaf Hussein, Hussein Haqqani or few NGOs fueling linguistic, sectarian and regional issues, their enmity against in Pakistan is not a secret anymore. Especially after the failure of armed terrorism in Pakistan now the fueling the hatred and chaos has been increased manifolds. 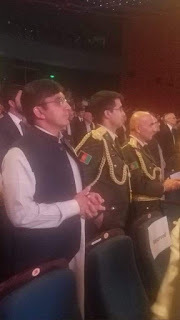 PTM was launched after the defeat of foreign-sponsored terrorists in the tribal areas. Apparently, PTM came into being in January 2018 as a reaction to the murder of Naqeeb Ullah Mehsood belonging to the Southern Waziristan in a fake encounter in Karachi. Before this, more than 318 persons had been murdered in the encounters by Karachi Police. Naqeeb Ullah was also murdered declaring him as a terrorist. When the family of Naqeeb Ullah protested against it, the whole nation supported them. However, PTM and Manzor Pashteen attempted to portray the murder of Naqeeb Ullah for his nefarious designs fueling the regional bias supporting the Indian and Afghanistan's conspiracy of Greater Pakhtunkhawa consisting of the Afghan and Pakistani Pakhtuns. Gradually the murder of the Naqeeb Ullah was ignored, the presence of Pakistan army in the tribal areas and the construction of the fence over the Duran line became the target of PTM. 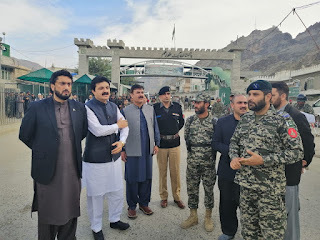 PTM started portraying Pakistan army as the cause of all the evils in the tribal areas and efforts of Pakistan army for the restoration of peace as the illegal occupation in its gatherings and protests, Mehmood Khan Achakzai from Baluchistan, NGOs and pro-Indian elements also came to support them. Few TV channels even telecasted the programs in the support of PTM under the Freedom of Speech. However, as soon as the nation came to know about the PTM's relations across the border and goals against Pakistan, PTM and Manzoor Pashteen lost support from the nation. 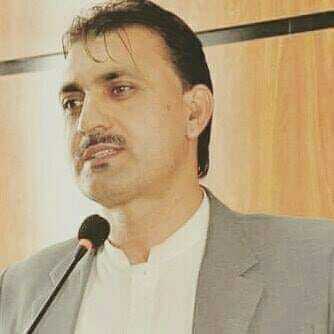 Suddenly, a brave officer of Police belonging to Northern Waziristan was kidnapped from Islamabad and afterward murdered in Afghanistan. As a result of great sacrifices the terrorism has been controlled in Pakistan, despite internal and external opposition, tribal areas have been merged into Pakistan which is unacceptable for the perpetrators of conspiracies from last 71 years. In such a situation the kidnap of a Police officer from Islamabad and shifiting him to Nangarhar, ISIS controlled province is not possible for terrorists alone. In the past the Shehbaz Taseer or Ali Haider Gillani were kidnapped by terrorists and they demanded releasing of their terrorists and money. 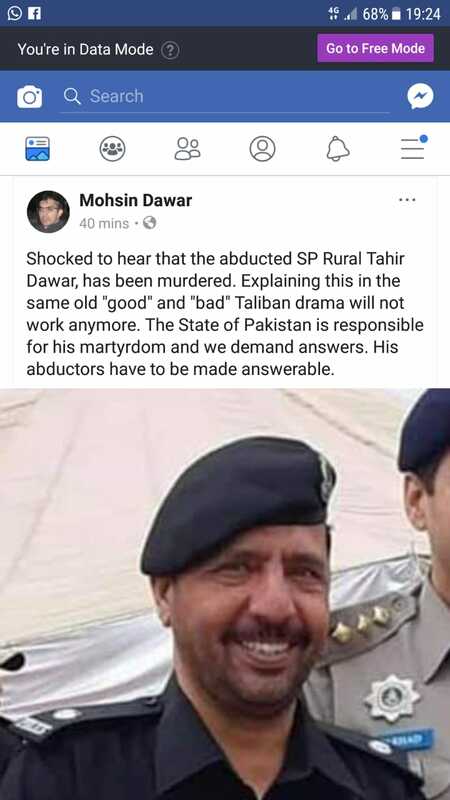 While SP Tahir Dawar was kidnapped to be murdered which is not the goal of terrorists alone. ISIS might be involved in the kidnapping of the SP Tahir Dawar however, involvment of NDS and Indian RAW cannot be denied. Moreover, the behavior of the Afghan govt. 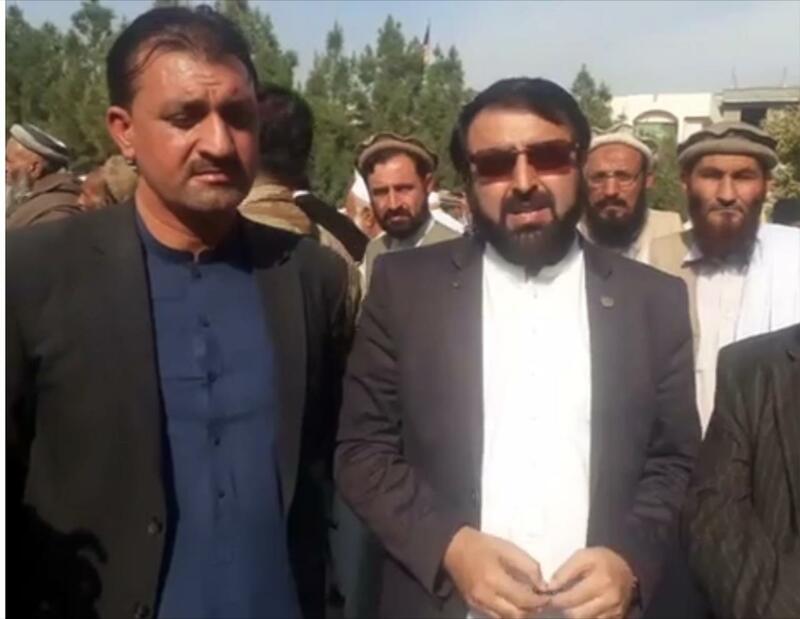 over handing over the dead body of martyred Tahir Dawar was not only agains the diplomatic values but also against the Islamic values. 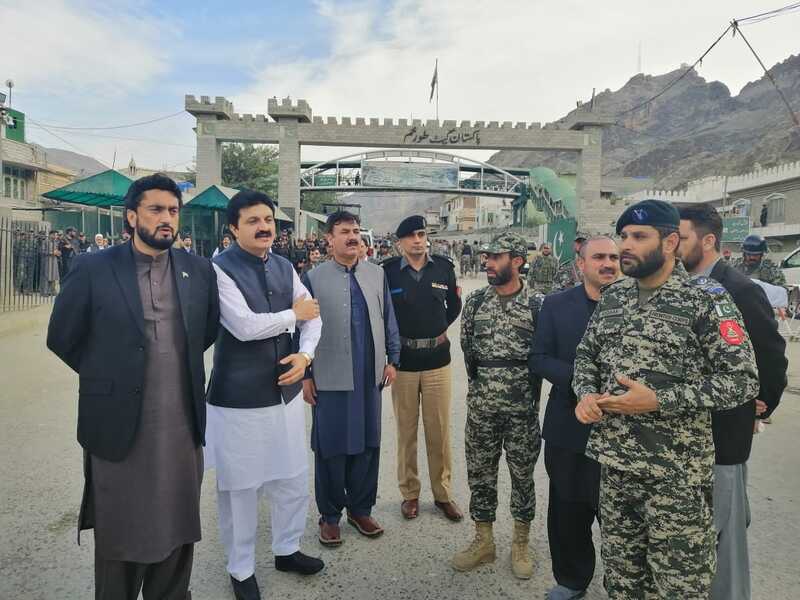 When the dead body was brought to the border, Pakistan's Ministers along with other officials were present there to receive the dead body they were forced to wait for hours. In the whole drama, the presence of Mohsin Dawar with Afghan officials and denial of Afghan officials to handover dead body to anyone except Manzoor Pashteen of PTM shows that SP Tahir Dawar was martyred to fuel hatred amongst tribal people against Pakistan so that PTM may get a new life. 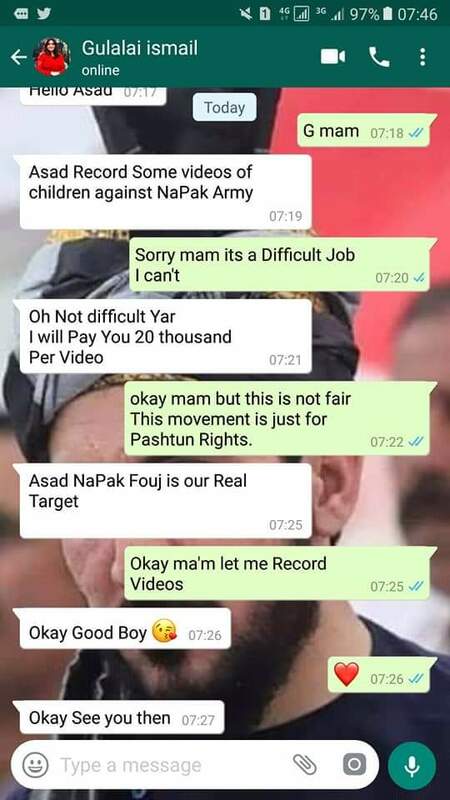 PTM has been raising the slogan of "Pashtun Watan" and wherever they chant this slogan tribal people and KPK people answer them with "Pak Watan". During the wait of 2.5 hours, Afghan govt. changed sides, attempted to hand over the dead body to anti-Pakistan Mohsin Dawar so that he may be made a hero in the eyes of the public. Martyred SP Tahir Dawar is the son of Pakistan. His murder in the Afghanistan, the presence of PTM representatives with Afghan officials, activities of PTM in the Afghanistan, the role of PTM in the murder of SP Tahir Dawar, the reaction of so-called nationalists should be investigated on the higher level.